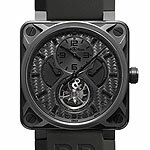 Basel 2008 is the first chance the public had to view some exciting new releases from Bell & Ross. The new Phantom Tourbillon is a stunning watch that is the all black version of the BR 01 Tourbillon that was released by Bell & Ross in early 2007. The Phantom features an all black case and dial, with the most noticable feature being the silver tourbillon that sits above the 6 o'clock position. The Phantom is a very limited production, with only 18 watches to be produced, far fewer than the 60 pieces made of the original BR 01 Tourbillon. The large 46mm case is made from a virtually scratch-proof DLC treated titanium. The dial is made from carbon fiber and the hands and indexes have been treated with a photo luminescent coating for easy readablility. In addition to the tournillon, the Phantom's complications include a regulator, a precision indicator and a power reserve indicator. It has a mechanical manual winding movement and is water proof to 100 meters. Rolex is releasing several watches at this year’s Baselworld, but perhaps the most impressive of all is the Sea-Dweller Deepsea. Like its name indicates, this watch is breaking boundaries in water resistance. With the development of a new Ringlock system, a new case architecture developed by Rolex, comes a watch capable of withstanding water pressure up to an astounding 3,900 meters. The ability to withstand such extreme depth is made possible in part by a high performance ring made of nitrogen alloyed stainless steel. 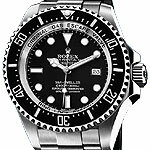 In addition the sapphire crystal on the Deepsea is substantially thicker than that of Rolex’s other Oyster models. The movement is a caliber 3135 and it has a 48 hour power reserve. An adjustable steel bracelet is equipped with a double extension system which is ideal for wearing over dive suits. Its new Glidelock clasp is adjustable up to 18mm by increments of 1.8mm. The Patek Ref. 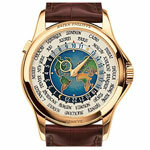 5131 is the next in the series of World Time watches released by Patek Philippe. The 5131, presented at Baselworld 2008, is only being produced in a single metal - 18k yellow gold. The new center dial features a map of the world made of cloisonné enamel, the product of an ancient metalworking technique. This new center dial is reminiscent of some of the early versions of the World Time such as The Europa. The 18k yellow gold case is 39.5 in diameter and has a sapphire crystal case back. The watch features 24 time zones including Frankfurt, London, New York, Tokyo, Hong Kong, and Bangkok and has the ability to switch between them by pressing a single button at 10 o’clock. It has a mechanical self-winding movement and a 48 hour power reserve. 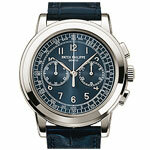 The highly sought Patek 5070 has a new addition to the family. 10 years after its launch, the new platinum version is now making its way on the scene and is sure to be one of the must have watches of the year. The technical and visual appeal of the 5070 are hard to beat, and the subtle changes made are sure to please. The new metal for this watch is accompanied by a new blue-metallic sunburst dial. This watch features a chronograph with a 30-minute elapsed time counter. The platinum case is 42mm in diameter and it has a sapphire crystal case back. Its base movement, the “Nouvelle Lémania” is an exclusive execution to Patek Philippe.